I was sent this very inspiring article by a dear friend, because I suppose, I always have some sort of crochet or knitting on the go and being South African, she knew that this would be something I would love to share with you all. 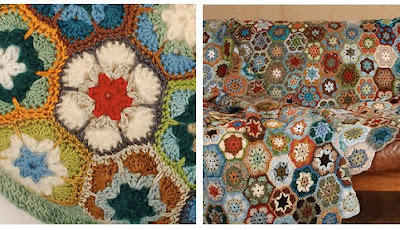 Please visit MoxyCrochet and have a look at the work this wonderful lady, Laura Summs is doing in a devastatingly improvised area. Take a look at the incredible blankets these crafters are crocheting. Such incredibly beautiful work that they are producing. The colours are amazing. Can you imagine owning one of these blankets or any article they make for that matter? Projects like this are so close to my heart, projects like this mean so, so much to the woman (and men) in Cape Towns, Khayeliesha, where some people are the poorest of the poor and live in really desperate conditions with not much hope of earning an income. It just takes someone like Laura Sums, with a vision, a passion and the skills to make a huge difference to these people. It gives them some sort of much needed, income and makes them feel like what they are doing is of value and worth. Well done Laura on a really good job, you are an inspiration. Crocheting is such a lovely craft, crocheting is to me what tranquilizers are to others. If I pick up a crochet hook I am so happy and relaxed. 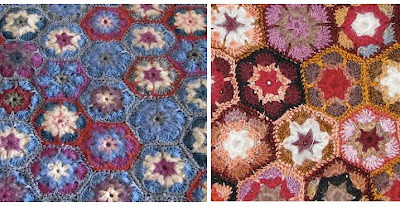 I don't crochet very advanced patterns, but what I love about crochet is that anything goes, any colour combination, which is what appeals to me so much. As I am doing one row in one colour I am thinking about the next colour that can be added. I found a pattern here last week that I thought was very pretty and different. I made one square with the idea of using up the purple wool I had left over from the flower cushion I made last month. now I have visions of making and owning a blanket of note! Just gotta make loads of squares. A perfectly wonderful winter project I think. 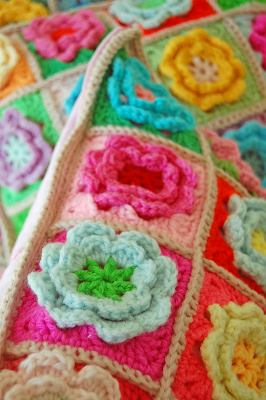 I love the purple crocheted blanket because purple is a favorite color of mine, but I also like the rainbow one. My sister sews, knits, and crochets, and I have always thought it was such a talent when one knows how to. I would love to have a blanket in those patterns. 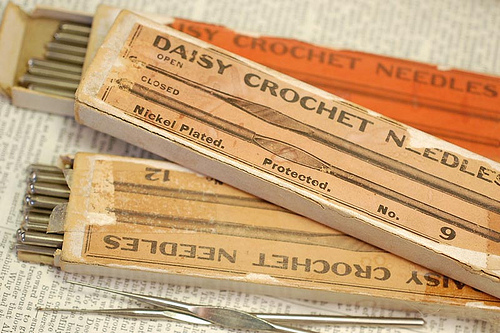 i wish i knew how to crochet, these look so cool!